If you have a disability, you are especially welcome. We have the boats, facilities, experience and resources to teach you to sail and allow you to broaden your horizons. Sailability Tasmania operates in three regions of Tasmania (Wynyard, Launceston and Hobart) – see contacts for information on operating times and locations. Sailability is a voluntary non-profit organisation that aims to provide a safe and friendly environment where people with disabilities are accepted and encouraged to participate in the sport of sailing. We are a part of a nation-wide movement that is a member of the International Foundation for Disability Sailing. Sailability Tasmania Inc. commenced operations in 1999. Sailability Tasmania will facilitate participation in sailing and boat usage at social, recreational and competitive levels on inland, estuary and ocean water for people with disabilities regardless of age and level of disability. People with disabilities of all ages, their families and friends, and able-bodied persons volunteering to crew our boats. To summarise, we have not yet refused anyone wishing to sail with us! We are a non-profit organisation that is heavily dependant on both Corporate and Government sponsorship. Clients availing themselves of our services are requested to provide a small donation to assist in meeting our running expenses. A major expense in the distant future will be the cost of replacing our yachts. In this regard, your consideration of a bequest to ensure the continuation of of our activities would be welcome and appropriately recognised. Regular sailors are encouraged to become a member of Sailability. 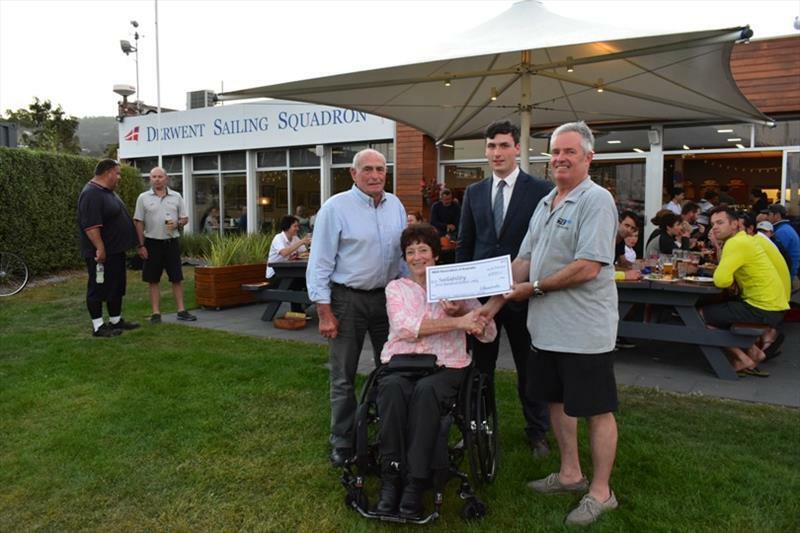 “The partnership between Sailability Tasmania and SB20 Australia continues to go from strength to strength with SB20 Australian Class President Stephen Catchpool presenting Sailability Tasmania's Julie Pearson and Brian Freeman with a donation of $500 at the Derwent Sailing Squadron this week.